The Yerushalmi mentions that a person who recites Parshas Hamon every day will never be lacking his parnossa. This teaching was later cited in the Mishna Berura and also explored in depth in the sefer Lechem Abirim by Rebbe Menachem Mendel of Rimanov. Today, however, segulos like reciting Parshas Hamon or Ketores seem to be greatly ridiculed and held in extremely low regard outside of the Chassidic world. What would you attribute this phenomenon to? We all have these little voices lurking in the recesses of our psyche. One of those voices is the Amalek voice. It, Chazal tell us, is the voice of doubt; it throws cold water on everything spiritual and everything Klal Yisroel might do (unfortunately, that voice is nurtured and promoted quite a bit in the blogosphere – as a good friend of mine aptly put it: "It's like Amalek jumping into the proverbial hot tub"). Another voice that pipes up is the Tzeduki (Sadducee) voice. As the Baal HaTanya explains, the Tzeduki theology is always with us; it is the voice that says: "I don't want to do anything more than I have to, and I'm definitely not interested in what the "Rabbis" come up with. I just want to know what G-d said I have to do, no more no less." So, whenever we take a Jewish custom, a hanhaga, a segula or a story of a Tzaddik, these voices, that voice of Amalek and the Tzeduki jump in with a laundry list of problems and complaints to minimize it and question its legitimacy. Every Chassidic story is shot down as a fairy tale, every custom, hanhoga or segula is labeled as ridiculous or of non-Jewish origin, etc. But then we have that other voice who says: "Emunah! Simple faith! Stop throwing cold water on everything already!" But that voice often gets shouted down by the ostensibly smarter, more intellectual, rationalist agenda. So here we have a minhag of reciting Parshas HaMon. And although it is not a minhag that I follow, all the debates out there as to its legitimacy are, in a word, rubbish. They are irrelevant. It reminds me of another argument: How can we give tzedoka to ______? How do I know if the tzedoka is actually completely legitimate? How do I know if the man is really so poor? But the bottom line is, it doesn't really matter. Because the point is not the specific individual tzedoka recipient – it's all about the giver! It's a mitzvah to give, and if the recipient isn't as legitimate as he claims, that's his business, not the givers. Similarly (and even more so), the point is not the specific minhag / segula / hanhoga, it's the intent of the one following it! This may help sum it up: R' Nachman said, "There are Rebbes who are not tzaddikim at all, but because of the emunas chachomim of their chassidim, their advice and brochos are mekuyom..."
Sadly, though, we are living in decidedly rationalist time. And while I agree with Napoleon Bonaparte when he said, "From sublime to ridiculousness there is only one step," I still do maintain that by deleting every supra-rational idea in the world of Yiddishkeit we throw out the baby with the bathwater. We live in anti-spiritual times, but I have met very special people in my life: People for whom Torah drips off their lips like honey; people who live with G-d at every moment of their day; people who inspire me on sight. And perhaps that's the difference: I know, deep down, that they live life the way I wish I did. I look to people like this and silently pray that I would spend eternity with people like this, and be saved from spending my eternity with the rationalists. 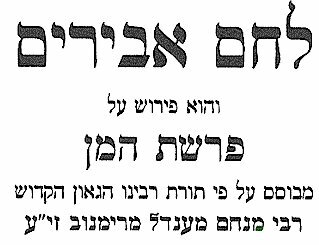 Sefer Hamiddos (Banim Beis #19)relates that reciting the portion of Bikkurim (Devarim 26:1-11) is a segula for having a male child. I recited this portion on a daily basis before and during my wife's second pregnancy and lo and behold, we had a son. I can personally attest to the fact that this one works 100%! Parashas HaMon conveys important lessons about life. We, too, get our daily allocation from HaShem and double for Shabbos. Reading this is to tell us the nature of parnossa in this world. Refreshing our understanding of this makes us more fit to receive HaShem's bounty every day. Bob: Thanks for the link. It can also be found cheaper here Do you happen to own a copy? CE wrote: Because the point is not the specific individual tzedoka recipient – it's all about the giver! It's a mitzvah to give, and if the recipient isn't as legitimate as he claims, that's his business, not the givers. I seem to recall that there is an inyan in Halacha to check to whom you give, & that you may not fulfill the mitzva of Tzedaka if you give to someone who is not hagun. The exception to this is on Purim, when "kol haPoshtim yad, nosnim lo" -- whoever puts out his hand, we give to. Please enlighten me if I'm wrong. Since we're already in sefer Shemos, let's all remember the special segula from RMM of Riminov, to recite Parshas HaMan, twice in Hebrew & once in Targum [Onkelos], on the third day [Tuesday] of Parshas Beshalach, or 2 weeks from today [Jan. 30]. ASJ said, "Bob: Thanks for the link..Do you happen to own a copy?" Yes, I have a copy, and it's worth buying. Most of it is arranged according the the parasha of the week, but the Mon-related discourses are grouped together. It also has interesting biographical info about the author and the translator. Now, there is a difference in addressing the optimal vs the realistic. Optimally all recipients should be worthy, etc. Yes, I agree. But, realistically, there are different degrees and a range of worthy recipients. The same is true for segulos, etc. But we are not supposed to stop giving because we are uncertain of the worthiness. Nor are supposed to assume guilt; everyone has a chezkas kashrus, unless there are warning signs - which is the besides the point of my piece really. CE: Okay, I did a little research & found in Shulchan Aruch, Yoreh Deah 251, the Gemara Bava Basra 9b is brought, where our Sages say that when someone comes asking for clothing, we check him out; but not someone who asks for food [בודקין לכסות, ואין בודקין למזונות]. Certainly the idea of "checking out" to find out if someone is worthy to give Tzedaka has its place in Halacha. And this was NOT indicated, perhaps even contra-indicated, in the part your piece which I quoted earlier. And please, there's a difference between "not investigating every collector to the N-th degree," and, "if the recipient isn't as legitimate as he claims, that's his business, not the givers." One can certainly be expected, so it appears from the Halacha I just mentioned, to do SOME sort of investigation, while not necessarily putting the recipient thru the 3rd degree! We have Minhagim, Segulos, etc., that are practiced by large portions of frumme Yidden. That makes them legitimate on their own. The same is true for people asking for Tzeddoka. Unless, there is a legitimate reason to suspect otherwise, we give tzeddoka to people & mosdos that are either accepted or have some kind of haskoma, hamlatza, etc. We do not, for example, check out the books of the mosad prior to giving them money - nor do we demand to inspect the living conditions of someone who asks for tzedoka. If we see a Yid in need, who has some sort of document or other method endorsing his cause, he is given the benefit of the doubt - unless there is a reason not to. Similarly, if someone starts a new minhag or segula that is not known of, we would treat it as suspect, just as we would perhaps treat a tzedoka that nobody heard of and has no haskomas, etc. I was never talking about those cases, and Parshas Hamon, or ketores don’t fall into that category. When I learned these halachos (admittedly quite a while ago) this was the way we were taught. Had this been a posting on the halachos of tzeddoka I would have spent more time covering the issue, but I was trying to make a point (perhaps poorly), and I didn’t think it was necessary to go into this at length here. 1. I must admit that after rereading my initial post, I see that Yitz's point is valid, as it clearly does seem like I am saying that there is no criteria needed at all to make sure that a cause is legitimate (which is wrong). When I wrote it, I didn't realize that it would be taken that way - but I should have. Sorry guys. 2. However, I just read R' Brody's remarks (linked above) and found them quite surprising. I clearly wasn't taught, and I never took the view, to narrowly define those limits of the halachos of Tzeddoka - to the contrary, we were always taught to broaden those limitations. If R’ Brody takes the position he does, I’m sure it has basis, but I am equally sure that it is not at all so simple. CE, Thanks for rereading your post. I know your post wasn't centered on Tzedaka, & I agree with just about everything else, but I did think that the point I raised was a valid one. Also, Rav Brody brought several sources for his piece, from Gemara & Poskim. If you learned differently, or remember differently, perhaps you could enlighten us with the sources you rely on. Otherwise, perhaps you should revise your own position. BTW, here's an interesting piece by Jonathan Rosenblum about being cheated by a Tzedaka collector. Back to segulos… here is another one I can attest to that works 100%.